While browsing through twitter and looking at South African hip hop artists – nje, passing time, I came across an interesting perspective: It’s a very new, not to mention vulgar idea that the spectator’s experience should be identical to, or even have anything to do with, the artist’s. With this said, it only made sense for Anitakinyi’s Miss Mediocre EP to be followed by an interview, a view of her own. BI: How did you decide on the title? 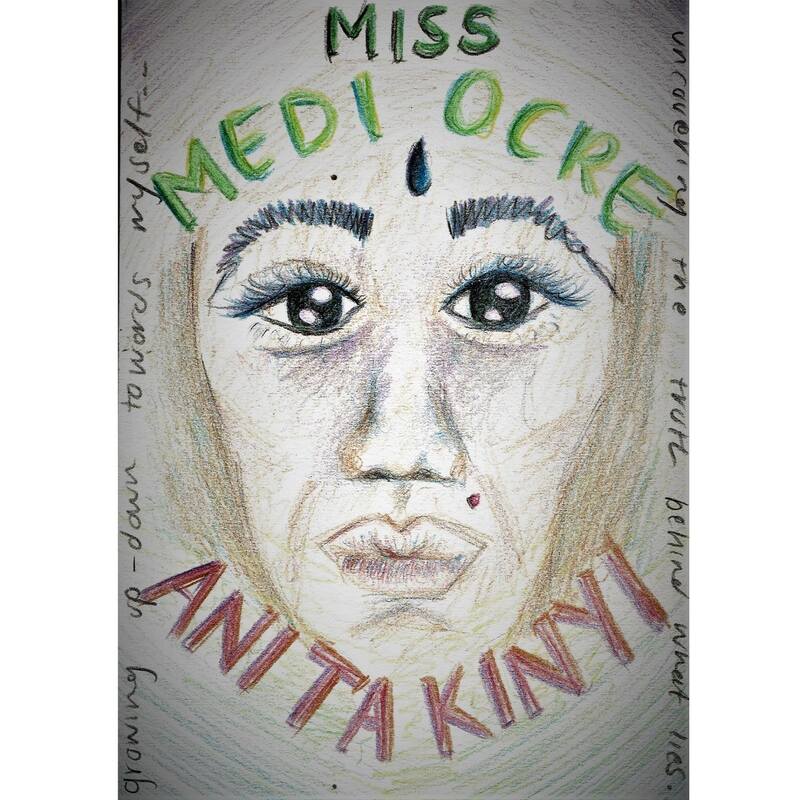 Anitakinyi: The title, Miss Mediocre, is a true reflection of how I felt about my vocal performance and life at that time. I am very insecure and hard on myself. I am growing, evolving, discovering and practicing, so I have a better relationship with my art now. I trust it will get better with time. When you’re constantly listening to vocalists like Erykah Badu, Lalah Hathaway, Thandiswa Mazwai etc. you tend to get insecure about where you are vocally. My life at the time was very mediocre. I was back in Port Elizabeth at the family house overseeing renovations. That was it. At home, watching people, build day in and day out. So I decided to buy myself a microphone and start recording the random ideas I came up with (to my friends beats) and adapting my diary notes to songs. Before I knew it, I had an EP. BI: What inspired the EP? Sitting at home idle will make you go crazy. This made me take it upon myself to try and create a body of work. The idea was to just start, no matter how bad it may come out, at least I would know what to improve on. Best decision I made, honestly. BI: How would you describe your sounds? Anitakinyi: My sound is eclectic. My voice alone is soulful and bluesy. I am an alto so I have the most fun in the bottom range of notes. I’d have to call it Neo-Blues/Neo-Soul for the lack of a better description. I do love Boom Bap but I know that’s not necessarily what I create, which breaks my heart. Such is life. BI: How did you relate to your writing process? Anitakinyi: I’ve been keeping diaries/journaling since high school. Then I started taking my poetry and songwriting seriously in college. So my writing process was fluid and natural at the time. The fact that I write so much naturally may be the reason why some people think that the songs on the EP are dense. [It] also helped that I went through a significant life experience at the time. That always makes writing a lot easier for me. I did my official recording of the EP with Transkei Monk (AOV) at his home studio in Zwide, Port Elizabeth (where he was residing at the time). He mixed and mastered the entire project as well. I’m very grateful for everything he did. He will forever be the homie. BI: What is your favourite song? Anitakinyi: “Something’s In The Air” is my favorite song. It may not be the crowd favorite, but it is mine. It was the first song that came out of me at the time. It also best embodies how I felt at that time. Also, it’s the first time I worked with Rez. He’s amazing! Honestly! Didn’t know there were beat-makers like him in Port Elizabeth until I met him. He introduced me to plenty other underground musicians that are actively pushing the sound that I’m into. Blessings! BI: You had no features on this EP (why is that), and who do you plan to work with in the future? Anitakinyi: At the time I was recording Miss Mediorce I was alone. I didn’t know any MCs that I thought would fit in with the content or that I caught a vibe with. Abstract Khem (@KENT_CVBN) is a dope MC but it didn’t really cross my mind to ask him. I guess it’s because we had a mini-fall out. I met Epic TheScriptwriter, who introduced me to JBux, in the mix and mastering stage of the project and felt that it was a bit late to ask him by then. BI: What else can we expect from you? Anitakinyi: I’ve recently joined a creative team (can’t disclose the name yet) that I will be working with for the next year or so. So you can expect more music, some music videos and plenty more performances with them. I’m also currently working with a vocal coach/mentor because practicing doesn’t make perfect if you’re practicing the wrong things. I’d love to expand my vocal range and refine my technique so that I can sing with an orchestra one day and not feel out of place (long term goals). [I] really want to play the Upright/Double Bass so I’m working on finding a mentor for that as well. I’ve been chatting to a percussionist from a German orchestra named Alexander Radziewski who is helping me find a mentor in Cape Town. The excitement is overwhelming. Think Esperanza Spalding. I know it’ll be plenty of hard work and dedication but I’m ready. BEEN ready. Lastly, [I] recently met amazing musicians that I’d love to form a band with, but we’ll seeing how things pan out. Vibrations and energies are everything, so we’re all still feeling those out. So there you have it, as the BI we’re excited about what’s next. So if you haven’t listened to the EP, make sure to click on the link right up top – have fun, and let us know what you think!